Dear Folks, George Romney wrote on March 13, 1947, on the letterhead of the Automobile Manufacturers Association. Well, by now most of you have had the really big news, but for those who havent, Willard Mitt Romney arrived at Ten AM March 12. As George detailed how precarious his wifes pregnancy had been, it became clear that there was a special level of wonderment embedded in this announcement, this birth. He told the familys friends how it had happened: Lenore had a lot of faith. George wrote, We consider it a blessing for which we must thank the Creator of all. From then on, Lenore referred to Mitt as her miracle baby. To many people the Mormon story still sounds strange or is simply unknown; even less well known outside the church is the central place of the Romney family in that story. One reason for that disconnect is that Mitt rarely talked about the special legacy of his ancestors. It is something he has held close, in a deeply private place. But the pride in his standing as one of Mormonisms first families is plainly there, a fact that was obvious to any visitor to Romneys home in Belmont, Massachusetts. In the foyer he had mounted framed portraits of five leading Mormon men, all Romneys, all figures who bear introduction if one is to reach into the elusive core of Mitt Romney. The first face on the walllong, lean, highbrowedwas Miles A. Romney, the man who brought the name to America, the earliest among them to hear the call. In the fall of 1965, Mitt Romney moved into the third floor of a Mission Revivalstyle freshmen dormitory on the sprawling campus of Stanford University. All seemed serene on the grounds known fondly as The Farm. The university had begun heavily recruiting the children of the eastern establishment to join the California¬-heavy student body, and Mitt, in his sporty blazer and narrow tie, seemed to fit right in. He had grown taller, his face was more angular and handsome, and he walked with the stride of a student who expected great things for himself. The initial calm would prove deceptive. The freshmen had begun their year as if closed in a bubble, but that wouldnt last long. Discontent began to smolder. The Romneys Mormon faith, as they began building a life together, formed a deep foundation. It lay under nearly everythingtheir acts of charity, their marriage, their parenting, their social lives, even their weekly schedules. The Romneys family;-centric lifestyle was a choice; Mitt and Ann plainly cherished time at home with the boys more than anything. But it was also a duty. Belonging to the Mormon church meant accepting a code of conduct that placed supreme value on strong familiesstrong heterosexual families, in which men and women often filled defined and traditional roles. That was how Mitt had grown up in Michigan. But for Ann, who had been reared in a family in which organized religion was viewed with skepticism, raising a devout Mormon brood would be a new experience, one she would learn and master along the way. By the time Mitt Romney walked into the Faneuil Hall offices of his mentor and boss, Bill Bain, in the spring of 1983, the thirty-six-year-old was already a business consulting star, coveted by clients for his analytical cool. He was, as people had said of him since childhood, mature beyond his years and organized to a fault. Everything he took on was thought through in advance, down to the smallest detail; he was rarely taken by surprise. This day, however, would be an exception. Bain, the founder of Bain & Company and a legendary figure in the consulting trade, had a stunning proposition: he was prepared to entrust an entirely new venture to the striking young man seated before him. He was, at forty--six, firmly established in his business career and contented with his life at home and church. He seemed to have it all. But that just left him with a question: what was left to do? So following a period of reflection, polling, and soundings with influential Republicans, Ann and Mitt Romney made up their minds: he would launch a campaign to oust Ted Kennedy, one of the United States great liberal fixtures, from the U.S. Senate. It was a bold proposition. This was Massachusetts, where Democrats reigned and the Kennedys were royalty. By 1994, however, the political climate had turned, and not in his favor. Around the country, voters had grown weary of incumbents. Republicans had proven they could win in Massachusetts. And Kennedy himself had just emerged from a period of reckless personal behavior. The 2002 Winter Olympics, which Salt Lake City would host in a few years, were in deep trouble, severely damaged by an influence peddling scandal. The Salt Lake Organizing Committee, swept up in a culture of corruption that permeated the high stakes international competition to get the Games, had embarrassed itself and the state of Utah by lavishing gifts on international Olympics executives. The shame of the scandal had sent corporate sponsors fleeing, leaving the budget for the Games woefully underfunded. Relations between the international and U.S. Olympic committees deteriorated badly. Morale among Salt Lake staffers nosedived. The competition would go on; there was little doubt about that. But there was a palpable sense of peril, particularly among vital supporters and sponsors. The Games needed a turnaround artist, and fast. The Mitt Romney who hit the campaign trail in 2002 was a different man from the political neophyte of 1994. He was, at fifty-five, now something of a media phenomenon; People magazine would soon name him one of the fifty Most Beautiful People in the World. With a high-profile public achievement now under his belt, he was that much more self-confident. After the bruising he had endured in his race against Senator Kennedy, he was wiser in the ways of politics, and as a result, he was tougher. Within days, his campaign produced television ads designed to preemptively beat back any Democratic attacks. It was a lesson learned from the Kennedy onslaught eight years earlier, which had typecast him as a heartless corporate raider. This time Romney would define himself, instead of letting his opponent do it for him. It was a sunny October afternoon in 2008, and Mitt and Ann Rom¬ney were making a return visit to the Massachusetts State House to meet with the portrait artist Richard Whitney. Together they walked to the third-¬floor office Romney had once occupied, its broad windows offering expansive views of the Boston Common and bus¬tling downtown. Whitney needed photos to paint Romneys official portrait. Romney had been clear about the image he wanted to convey for posterity. Wearing a blue suit, white shirt, and striped tiethe dress uniform of a businessmanhe would be sitting on his desk in front of an American flag, next to symbols of two things he held dear. The first was a photo of his wife, the center of his personal universe. The second was the Massachusetts health care law. He wanted to be remembered for that, Whitney said. It was just hours after passage of his health care bill- the single greatest achievement of his political life-and Mitt Romney's thoughts had turned to Iowa. Settled into a top-floor suite at the Ritz Carlton hotel, high above Boston Common, he was expecting a relaxed, chatty evening with a handful of Republican leaders from the first caucus state. But the meeting quickly went awry. Romney had hoped that one of his guests, Doug Gross, would become chairman of his Iowa campaign. But Gross, an intense man who had grown up in a town called Defiance and was now a high-;powered lawyer in Des Moines, wasn't convinced. He grilled the Massachusetts governor, beginning with a subject he knew might upset Romney: how would Romney handle questions about his Mormon faith in a state where the GOP caucuses are dominated by Christian conservatives, many of whom don't believe that Mormons are Christians? Looking ahead to 2012, Romney concluded that he needed a different kind of campaign. He looked again to his close circle of advisers in Boston, who had learned from their mistakes and grown and changed in the intervening years. The two bickering media teams of 2008 were reduced to one. 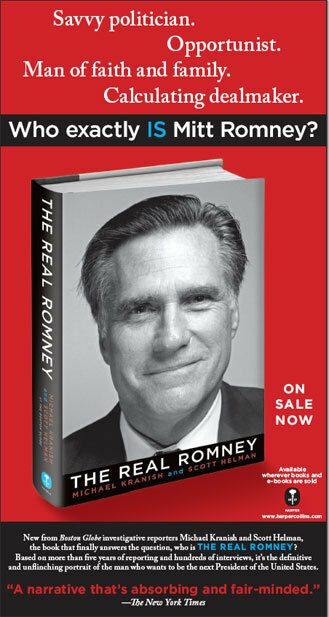 After spending $2 million to win Iowa's straw poll in 2007, Romney would refuse to participate four years later. Instead of spending millions of dollars on early campaign ads, he would hoard his campaign cash. In a frank admission, Romney acknowledged that his major mistake in 2008 had been quite simple: he had failed to get across what he was really all about. Once again, he had lacked definition. "Whether through my ads or through my responses to debate questions or on the stump," he said, "my power alley is the economy."